2+ monsters with different names This card gains effects based on the number of monsters used for its Link Summon. ● 2+: If a monster(s) is Normal or Special Summoned to a zone this card points to: That monster(s) gains 300 ATK/DEF. ● 3+: Once per turn: You can Special Summon 1 monster from your hand. ● 4: When this card is Link Summoned: You can draw 4 cards, then place 3 cards from your hand on the bottom of the Deck in any order. Saryuja Skull Dread had a ton of hype behind it, and for good reason, it comes in at #8. A Link 4, the more you commit to it, the better the effects you get. You can use two monsters with different names to summon this Dragon, but that will only get you the first of its possible three effects. 300ATK/DEF for any monster summoned to a zone SSD points to isn’t too applicable in the long run. Three monsters gets you that ATK/DEF addition, as well as the ability to Special Summon a monster from your hand once per turn. An additional summon is always useful, and for it to be a monster that doesn’t have a Special Summon effect is even better. Normal Summon effects twice per turn can be huge for some decks. Four monsters nets you the previous effects, and now you get to fix your hand. Draw four, cycle back any three in your hand. The more cards in your hand when you get this effect off, the better. This is the effect that made SSD so hyped. You can use tokens and a monster to get this effect off with ease and reap the benefits of all its effects. With three link points pointing down, SSD opens up your monster zones for your Extra Deck like on other Link Monster has done until now. It is bad that SSD points up with one of its link points, and you could unintentionally give your opponent a monster with 300ATK/DEF more, but again, that isn’t going to be relevant to the game state. You make Skull Dread, fix your hand and combo off with the extra Special Summon and open zones. At number 8 we ave one of the more powerful Link-4 Monsters in the game, from Extreme Force we have Saryuja Skull Dread. Skull Dread is a Link-4 Dragon EARTH with 2800 ATK and arrows pointing Up, Bottom Left, Bottom, and Bottom Right. ATK is strong for a monster this big, arrows are good but the Up would of been better if it was Left or Right, Dragon is great, and EARTH can be worked with. The summoning requirements are 2+ monsters with different names, which is simple with other Link Monsters and Tokens in the mix. Saryuja gains effects based on the number of monsters used for it’s Link Summon. 2+: All monsters summoned to zones it points to gain 300 ATK and DEF. 3+ Once per turn, you can Special Summon 1 monster from your hand. 4: When this card is Link Summoned, you can draw 4 cards then put 3 cards from your hand back to the bottom of your deck in any order. The first effect is nice to give your monsters you summon to your Main Monster Zones a small boost, but it can boost an opponent’s monster with that Up arrow, so thankfully the boost isn’t too significant. The second effect is a great extender for plays, especially when the Guardragons come out in early 2019, cause getting monsters on the field can lead to some big plays, just ask the newly banned Firewall Dragon. The final effect unbricks your hand so much, unless you’re unlucky. This draw effect has also seen use in the new Slash Draw FTK with multiple Saryuja so you can make sure your Slash Draw lets you draw another Slash Draw after you go through most of your deck. Saryuja is one of the best Link-4s we have and is a staple for many decks because of the unbricking power, the extending of plays with the Special Summon, and the arrows. Just as long as you can easily invest 4 monsters with different names. Art: 4.75/5 It is scary and awesome at the same time. Saryuja Skull Dread was/is one hell of a Link Monster, and a great target for one of the best cards of the year. Dragon has a plethora of support, the 2800 attack is phenomenal, and arrows pointing up and down, as well as the bottom diagonals all help to make this a powerhouse. This is a Link 4 who grants you more/better effects based on the number of Monsters you use to commit to its Link Summon. 2+ gives you a 300 point increase for Monsters attached to it via its own Arrows, which is nice enough, but still fairly negligible overall. 4+ Lets you draw FOUR cards from your Deck (and then return 3 of them back to your Deck, at the bottom, in the order you choose). It’s a beautiful combo/finisher card. If you can’t get what you need from the Draw 4 (you should be using that effect about every time) and pull off the Summons/Attacks you need to win, that’s your own problem. This reminds me of some other dragons in yugioh, but in a good way. 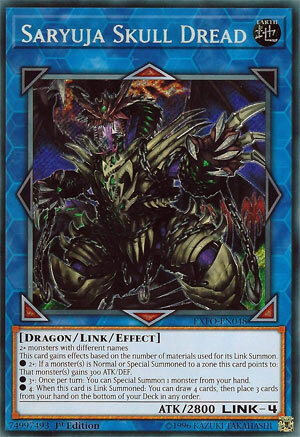 Saryuja Skull Dread is a Link 4 Earth Dragon-type Link Monster with 2800 Atk and all three bottom arrows and the up arrow. You can use 2 or more monsters to Link Summon Saryuja so long as they have different names. You want to use 4 monsters so you can gain the most from the effect. Using only 2 gives pointed at monsters that are Normal or Special Summoned 300 Atk and Def. 3 or more lets you Special Summon a monster from your hand. 4 lets you draw 4 cards and put any 3 on the bottom of your deck. The effects stack so it is advisable to use all 3 to their fullest potential. Since any deck can summon Saryuja, I was expecting a higher spot on the list. Fixing your hand is busted, Special Summoning for free is what got Firewall Dragon banned, stat boost is negligible and cute, finally, ease of summoning a beater off Scapegoat is too good. Looks awesome, run them if you have them.